The mysterious moonstone, prized for its moon-like sheen, has been used for centuries in a variety of cultures. Being a perfect expression of the yin feminine energy and the soothing energy of the moon, the moonstone brings calm, peace, and balance. The tranquility that the moonstone generates has a sensual, other-worldly quality to it; it is infused with an enchanting, soft glow of deep vitality and creative energy. It is not a passive state, but rather a glowing healing energy of renewal that can envelop you like warm healing waters and help let go of negative energies. 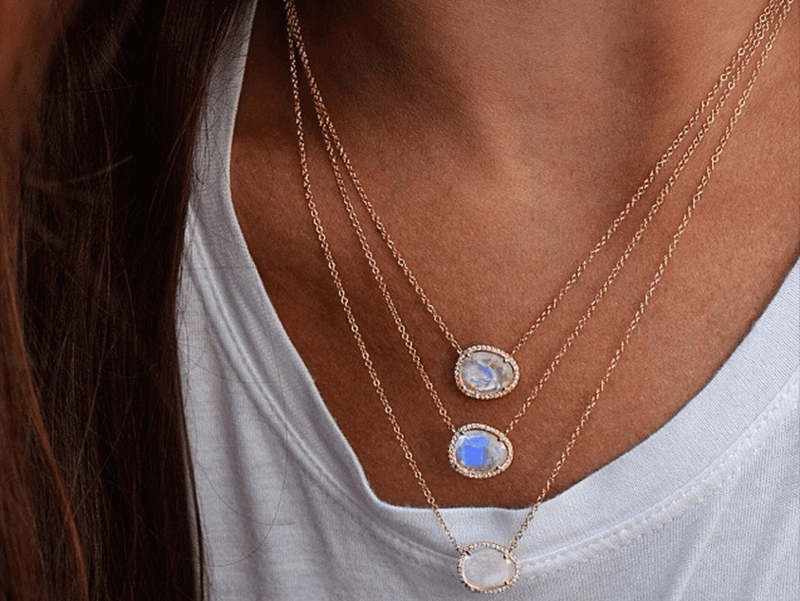 The meaning of moonstone is in its energy—a nourishing, sensual, deeply feminine energy that knows how to heal and bring you back to wholeness. It is the stone of the mother moon, deep healing waters, and sacred feminine energies. With its high energy rays of purple, gold, and blue colors, the mysterious moonstone is always enveloped in a shimmering white energy; this makes it a protective stone. Moonstone is a master healer for women; it brings soothing, healing, calm energy and helps regain your power and inner balance. If you wear your moonstone often, you will also start receiving insights into how you are mistreating your personal energy and how to learn to love and heal yourself. It can bring insights into the powerful mysteries of true female power and the essence of all healing. The milky moon, the motherly energy, the peaceful cocooning in healing silence, the bringer of soothing calm, and gathering your power back—all these properties are attributed to the beautiful and mysterious moonstone. The clearer the moonstone is and the more colorful its glow, the more healing are its energy properties. Moonstone is a semi-precious stone and quite abundant, so it is not expensive. Moonstone is popular in jewelry because this is where it can serve the best. Each moonstone is unique so allow yourself to experience different moonstones in different jewelry forms, as well as the moonstone jewelry meaning. It might be a moonstone pendant that will best soothe your heart, or maybe it is a moonstone ring that will fit just right because it touches the energy meridian connected to your inner balance. Sri Lanka and India are the major providers of moonstone of the market, but it can also come from the United States, Brazil, and Australia. In feng shui, the moonstone is used for its calming, yin energy abilities, as well as for the energy of the water feng shui element it re-creates. A home or an office with a lot of fiery yang energy can benefit from the ability of moonstone to bring more balance. You can find Buddha moonstone pendants in many online feng shui shops, moonstone being a perfect expression of the assimilation of a more enlightened state of being. The energy of Quan Yin and White Tara are also often expressed in various moonstone carvings and pendants. Moonstone spheres and eggs are also popular with many feng shui enthusiasts; the energy of moonstone is excellent feng shui for the southwest (love and marriage) bagua area. Moonstone comes in several different shades, but the light pink color moonstone is the best choice for your southwest area. It is important to take proper care of your moonstone, be it in jewelry, spheres, eggs, or tumbled stones. Cleanse it gently and often and try to limit its exposure to strong sunlight. By taking good care of your moonstone you will in return receive the most nourishing abundance of beautifully balanced and healing energy. As you can guess, unlike other crystals and stones, the best way to recharge your moonstone is by the light of the moon. You can choose either the fresh energy of the new moon or the potent presence of the full moon energy.